“Loving oneself is harder than loving others,” to quote a line from one of BTS’ new songs. And Jimin confessed that he has been struggling with self-love as well, sharing a few of the insights he’s gained over the past two years while promoting the group’s multiyear “Love Yourself” series. “What I realized from our narrative is that we’ve been failing to love ourselves while urging others to do so. I’ve contemplated whether I’m on the right track and what I’ve been living for,” said Jimin during a press conference for the group’s new album. Suga also said he’s grown up a lot while promoting the series, which centers on its members’ narratives. “Since we’ve always been talking about ourselves and the stories of our generation, we’ve realized a lot of things. As we are human too, we find ourselves growing up while touching on the issues that others are also going through,” he said. 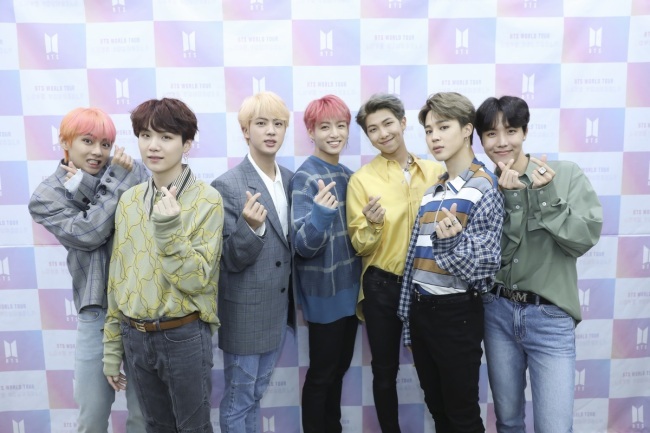 Following the two-day Seoul leg of the “Love Yourself” world tour series, which ended Sunday, BTS will head to North America next month for stops including the first-ever stadium show by a Korean act at Citi Field on Oct. 7, before taking the tour to London, Amsterdam, Berlin, Paris, Tokyo, Osaka, Nagoya and Fukuoka.